This article by healer Joan Newcomb resonated with me - I have always felt differnt from otehrs and was bullied at school for it. I still sometimes worry too much abput what will others think. It is good to be true to myself and as Joans says to be a light for others. Today I watched a video by Oral Roberts' adult grandson, who is gay. He wrote a letter to his Uncle Ronnie, who was also gay, and committed suicide in 2003. Their evangelical Christian family overtly condemns homosexuality and is convinced they'll go to Hell. I think it stayed with me because there's a thread of 'hellfire and brimstone' Christianity in my family and, although not gay, I'm quite different from the rest of them. However, I thought being different was a good thing. I couldn't help but be different. I'm the only girl (I have three brothers). I was born overseas in Berlin (they were all born in DC, in the same hospital, delivered by the same doctors). And I'm the only one in the family with hazel brown eyes (they all have blue). And, from the time I was five, we lived in different countries, moving every two to five years. So I got used to being the American, the foreigner. The advantage of being different is that you're not swayed by your peer group, since you don't feel you have one. When you're not trying to be like anyone else, you get to be uniquely yourself. This resulted in the psychiatrist recommended that I not live at home, so I finished 11th grade living at the Y. As it turned out, I didn't finish high school because my family was stationed to Sweden and I went to college early. Then I didn't finish college because I went to London to go to drama school instead. Fast forward to my late 30's as a single parent on food stamps. I struggled with being suicidal and made choices that wouldn't 'tip me over the edge'. I didn't work full time and I didn't commute to the city, which impinged my earning ability. Things did not turn around until I was 44 and in the midst of mourning the death of a loved one, which I've written about before. I was grieving and at the same time in communication with his Spirit. I got the distinct impression how, as Essence, we are all connected. This lifetime happens in the blink of an eye to Spirit. On Earth we may have another five or ten or fifty years before we get to experience a reconnection with our loved ones. But to Essence, it's instantaneous. When someone dies, we are still connected with them on this level. And that life on Earth is a place to *play*. It's like being in a big swimming pool. Committing suicide is like getting out of the pool before swim time is over. So why not fully enjoy everything about life while we're here? Then I began to apply the teachings of Abraham-Hicks. I started noticing my thoughts. I realized that all day long I'd imagine conversations with people where I'd be telling them all the terrible things that were happening to me. I literally had to grab myself by the ears and redirect my thinking to more positive things. After just two or three weeks of consciously 'changing the subject', I found myself lifting out of this depression that I'd been in for years. (On a neurological level, negative thoughts create neural pathways in your brain, and your thinking goes along these "ruts". When you change your thinking, it changes the neural pathways so your thinking can go along more positive lines. This changes your brain chemistry as well). Today I make choices that direct me towards the light, towards the positive. I don't hang around in negative or crazy-making situations. My work focuses on empowering people to do the same. Nowadays many of us are going through challenging and painful times. Things we've identified with are falling away and our true Selves are emerging. We no longer fit in old careers or old relationships, we're being called to be the Essence of who we are, and our work and relationships must align with our values. Some people are plagued with suicidal thoughts, because their body/personality cannot imagine life beyond the limitations it is currently living. When everything it identifies with disintegrates, it believes it is dying. It only know what has been and barely understands what is. Your Essence, however, fully comprehends, embraces and enjoys these changes. We are being called to be different. There is no body exactly like you. As Source we are One, but through the physical, your Essence is Unique. Your vibration is an important melody contributing to the orchestral composition of Life. When you align with your Essence, your note sounds strong and clear. How do you do this? Tune into yourSelf. Turn towards what makes you happy. What pleases You? Sometimes you do need space from others who aren't happy themselves, or who want you to stay the way you were. As you separate from them, supportive people will come into your life. As you turn away from invalidation, the invalidators will squawk. Let them. The most important thing to remember is that Light is greater than darkness. Truth resonates more potently than lies. Bullies, dictators, fundamentalists may be loud but they do not last. They end up self-destructing. When you stand in your Light and Truth, you will feel Joy. And that Joy will ripple out to others. And gives permission to others to do the same. You will be a blessing and a healing to all around you. So this week, take baby steps. Start by noticing and redirecting your thoughts. Or if your done with baby steps and cannot hold back any longer, leap. You will be supported. You will be leaping into a life better than you have even dreamed. This entry was posted on March 26, 2011 at 12:31 AM and has received 1167 views. There are currently 0 comments. Print this entry. This Wednesday Sandbox gathering we learn how to ask for what we want and explore our desires and needs. Many of us are afraid to ask for what we want in a relationship for fear or either not getting it or of having the other person give it to them out of obligation. Asking for what you want is an act of trust. You are taking a step into the unknown – not knowing how the other person will respond. We are giving up control because when we chose to relate we don't know what the answer will be. And in my experience it is better to practice lots of asking and getting some No than to avoid asking and then making asking a request mean more than it does. This week we will practicing saying what we want, what we don't want and from who. And renegotiating these requests when we notice that our feelings have changed. Oh my goodness what if others get angry or upset by our requests? We will work with that energy too! We will work with some of the skills from Susan Campbell's book Getting Real. This entry was posted on February 24, 2010 at 11:30 PM and has received 1379 views. There are currently 0 comments. Print this entry. Here are some great Assertiveness and Authenticity tips from Oprah Mag. This entry was posted on November 3, 2009 at 7:00 PM and has received 1494 views. There are currently 0 comments. Print this entry. Interesting article by relationship author Sharyn Wolf on fighting in a relationship suggesting that if you are stuck in a pattern of "always" fighting with your partner in a particular situation then get the fight out of the way beforehand. I would add the idea of doing the pre-fight in gibblerish too to avoid hitting more triggers on the way. This entry was posted on September 25, 2007 at 4:07 PM and has received 1631 views. There are currently 0 comments. Print this entry. There seems to be a big gap in levels between irritation and anger - any suggestions on what fits in there? This entry was posted on September 20, 2007 at 9:51 PM and has received 1614 views. There are currently 0 comments. Print this entry. Usually at group when someone has an issue to work with someone who is not present (eg their mother) on I ask for a volunteer to role play the other person so that the first person has someone to express their feelings towards. The volunteer doesn't have to say anything - just sit there, make eye contact and listen. Last night a new group member said he thought this practice was unhealth for the receiver. Any thoughts on this? What I came up with at the time is that when I receive for someone else that I notice that their emotions no matter how hot are on their site of the fence and that if I react emotionally it is due to my triggers. It has also helped me get over my fear of being with anger from others because I know if I breath and stay with them it will pass. On the giver side I think it helps them really imagine that they are talking with their mother or who ever they are role playing. Of course the usual idea is that after group they will go to the real person and express themselves too! This entry was posted on September 20, 2007 at 9:50 PM and has received 1420 views. There are currently 0 comments. Print this entry. 1. Do you agree or disagree: It's never okay to feel angry! 2. Do you agree or disagree: If you feel sad, there is something wrong with you! 3. Do you ever have big mood swings? Describe what they're like. 4. Have you ever been confused about your feelings -like you knew you were feeling a strong emotion, but you didn't know what? 5. Have you ever said you were feeling one thing when, really, you were feeling something else? 6. Do you think it's important to understand what it is you are feeling? Why? What can happen if you don't? 7. Do you think there's something wrong with you if you don't always feel wonderful? Is it okay to sometimes feel blue? Why, or why not? 8. 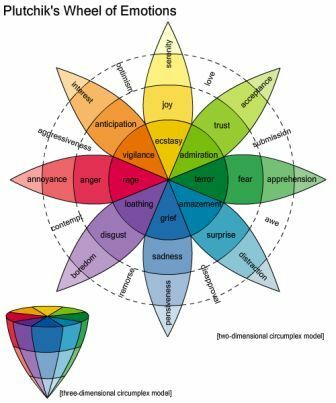 Are some emotions more difficult to express than others? Which are they? Why are they hard to express? This entry was posted on September 18, 2007 at 9:52 PM and has received 1445 views. There are currently 0 comments. Print this entry. Many of us are afraid to ask for what we want in a relationship for fear or either not getting it or of having the other person give it to them out of obligation. Asking for what you want is an act of trust. You are taking a step into the unknown – not knowing how the other person will respond. This entry was posted on August 20, 2007 at 5:07 PM and has received 1369 views. There are currently 0 comments. Print this entry. Usually you are projecting parts of yourself (both the so-called positive and the so-called negative parts) which you have not seen, which are unconscious, and for which you have not yet taken responsibility. This is particularly true when you are reactive to what you see outside of yourself. By "reactive," we mean you have an unusual amount of energy attached to the particularly perception or that it has a "charge" for you. The more energy you have on something, the more you can be sure that what has touched you from the outside concerns what is happening inside yourself. I once thought Rhea was very insecure during one of our seminars, and I criticized her for it. When she hesitated in her response to a question, I thought she didn't trust her answer [which convinced me I was right]. Months later, I discovered the insecurity I had perceived as hers was actually my own. This entry was posted on June 18, 2007 at 5:08 PM and has received 1531 views. There are currently 0 comments. Print this entry. she comes to visit you and a group of friends do you let her in and greet her or do you make chatter to fill the void. Silence brings the gift of not knowing, of the void. Silence can connect us with spirit. 2. I find it frustrating when someone takes a long time to make his point. 3. If someone asks me a questions, I usually answer it right away, without much reflection. 4. If I ask someone a questions, I like her to answer it right away and not leave me hanging. 5. I sometimes ask a question and then answer it myself without giving the other a chance to reply. 6. I find it hard to tolerate ambiguity, uncertainty or being in limbo. 7. When I am around the house alone, I often keep radio, television or music playing in the background. 8 I like to keep busy (or, even if I don't think I like it, I usually am busy). This entry was posted on May 14, 2007 at 4:22 PM and has received 1507 views. There are currently 0 comments. Print this entry.